At the invitation of the Republic of Serbia, Vice Chairman of the Standing Committee of the National People's Congress Ji Bingxuan, as the special envoy of President Xi Jinping, will attend the inauguration ceremony of Serbian President Aleksandar Vucic to be held in Belgrade on June 23. China and Serbia enjoy profound traditional friendship. The two peoples hold amicable feelings towards each other. We are good friends and good partners that trust each other and share weal and woe. The two sides stay committed to upholding each other's core interests and major concerns. Recent years have witnessed frequent high-level mutual visits, strengthened political mutual trust and fruitful achievements reaped in the bilateral cooperation in transportation infrastructure and energy and other fields. The two sides have maintained close communication and coordination in international and regional affairs. The Chinese side has always viewed the China-Serbia relations from a strategic and long-term perspective. China stands ready to work with Serbia to cement political mutual trust and friendship between the two peoples, deepen pragmatic cooperation across the board and continuously move the China-Serbia comprehensive strategic partnership forward to deliver greater benefits to the two peoples. Q: On June 19, the US Department of State gave a briefing on the upcoming first China-US Diplomatic and Security Dialogue, highlighting the Peninsula nuclear issue and maritime and security issues as topics for discussion. How do you comment on that? A: Based on the consensus reached between Chinese President Xi Jinping and US President Trump during their meeting at the Mar-a-Lago resort and as agreed by the two sides, the first China-US Diplomatic and Security Dialogue (D&SD) will be held in Washington D.C. On June 21. Chinese State Councilor Yang Jiechi will co-chair the dialogue with US Secretary of State Rex Tillerson and Secretary of Defense James Mattis. General Fang Fenghui, member of the Central Military Commission of the People's Liberation Army (PLA) and chief of the Joint Staff Department of the PLA will also attend the D&SD. The two sides will have an exchange of in-depth views on China-US relations and other important international and regional issues of mutual interest. China stands ready to work with the US to push for positive outcomes of the D&SD. On the Korean nuclear issue, China's position has always been consistent and clear. We stay committed to denuclearization of the Korean Peninsula, peacefully resolving relevant issues through dialogue and negotiation and upholding peninsular peace and stability. We hope relevant parties can take their due responsibility, meet each half way and work jointly for the proper handling and settlement of the Korean Peninsula nuclear issue. 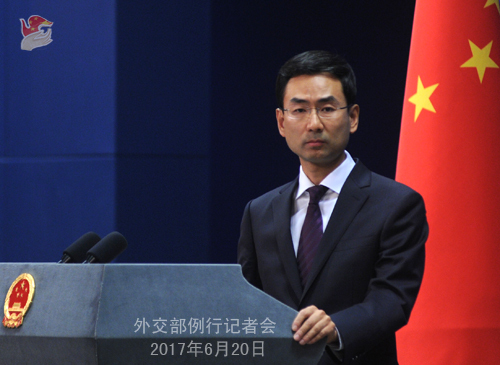 China wishes to keep communication and cooperation with the US and other relevant parties. On the South China Sea issue, we have stated our principled position many times. Now with the concerted efforts of China and ASEAN countries, the situation in the South China Sea is turning better while maintaining stability, and the issue has come back to the right track of peaceful solution through negotiation and consultation. We hope relevant parties will respect the efforts by regional countries to peacefully resolve the issue through negotiation and consultation and do more things that are conducive to regional peace and stability. On terrorism, both China and the US are the victims of terrorism, and reinforcing cooperation in this regard serves the interests of the two sides. We hope the two sides can, on the basis of mutual respect, equality and mutual benefit, exchange views and expand cooperation on counter-terrorism issue of mutual concern. Q: The high-level strategic dialogue between the foreign ministries of China and the ROK was held today. Can you brief us on the outcomes of the talk between the two sides? Has the issue of China-ROK state leaders' meeting been discussed during the talk? A: Chinese Executive Vice Foreign Minister Zhang Yesui and First Vice Foreign Minister of the Republic of Korea (ROK) Lim Sung Nam held the high-level strategic dialogue between the foreign ministries of China and the ROK in Beijing today. During the dialogue, the two sides candidly exchanged in-depth views on respective internal and foreign policies, bilateral relations, the THAAD issue and the situation on the Korean Peninsula. The two sides agreed to strengthen communication, properly handle differences and push for a quick return of China-ROK relations to the track of steady and sound development. State Councilor Yang Jiechi met with First Vice Foreign Minister Lim Sung Nam preceding the strategic dialogue. During the meeting, Yang Jiechi said that, China and the ROK are each other's important close neighbours, and China has always valued developing China-ROK relations. The two sides should effectively implement the consensus between the state leaders, bear in mind the original aspirations for establishing the diplomatic ties, stick to the general direction of friendship and cooperation, and respect each other's core interests and major concerns. We hope the ROK can demonstrate political will and resolution, honor the commitment and work with China to strengthen communication and coordination to push for immediate improvement and development of bilateral relations. Lim Sung Nam said that, President Moon Jae-in hopes to improve and develop China-ROK relations. This year marks the 25th anniversary of our diplomatic ties. The ROK hopes to, taking it as an opportunity, strengthen communication and coordination with China and promote important advancements in bilateral relations. As to your question on whether they have discussed the meeting between the two state leaders, I have no information at hand at the moment. Q: Yesterday, the Meeting of the BRICS Ministers of Foreign Affairs was held in Beijing, during which the five countries discussed the current international situation and international and regional hot-spot issues. Some commented that though the BRICS cooperation is supposed to be an economic cooperation mechanism, China tries to push for stronger cooperation in the field of politics and security among BRICS, so as to counter the influence of the US and the west. How do you comment on that? A: The Meeting of the BRICS Ministers of Foreign Affairs was successfully held in Beijing yesterday. The five countries exchanged views on such major issues of mutual concern as global politics, economy and financial sector, as well as BRICS pragmatic cooperation and the preparatory work for the BRICS Summit in Xiamen. The meeting has issued a media note. We have released relevant information in a timely manner and it is on the foreign ministry's website for your reference. The "BRICS" was first put forward as an economic concept and the cooperation between BRICS countries centered on the economic field at the very beginning. The BRICS countries are all developing countries and emerging markets with important influence, which share the same or similar views on a series of major international issues. So it is only natural for the five countries to sit down together to exchange views and coordinate stance on the international situation, including the political landscape and the international and regional hot-spot issues. This is conducive not only to safeguarding international peace and security and advancing the proper settlement of relevant hot-spot issues, but also to upholding the common interests of the vast developing countries and advancing the democratization process in international relations. In fact, the Meeting of the BRICS Ministers of Foreign Affairs was held as early as in September 2006 in New York on the sidelines of the UN General Assembly. Moreover, in recent years, the BRICS summit discussed political and security issues several times. Politics and security, economy and finance and cultural and people-to-people exchanges have formed the three pillars of BRICS cooperation. I want to stress that BRICS cooperation has always followed the spirit of openness, incisiveness, cooperation and win-win results. The BRICS countries do not seek clique or military alliance, nor do we try to target at, challenge, offset or replace any one. The BRICS countries stand ready to work with other countries to jointly build the community of shared future of mankind. Also, China is willing to work with other BRICS countries to move BRICS cooperation forward in a more in-depth way, and make new positive contributions to promoting peace, stability, development and prosperity of countries and the world and jointly meeting global challenges. Q: You have answered several questions about the Meeting of the BRICS Ministers of Foreign Affairs, and bilateral meetings were also held during that meeting. The Indian Minister of State for External affairs Singh had a bilateral meeting with Foreign Minister Wang Yi. How do you comment on that?Was the contentious issues that sparked differences between the two countries in recent times figured in the discussion? In addition, terrorism also figured prominently in the joint statement issued at the end of the meeting. Foreign Minister Wang Yi also talked about terrorism. Russian Foreign Minister spoke about the need for establishing headquarters to deal with terrorism in New York in support of UN Secretary-General's proposal to establish a counter-terrorism mechanism under the UN framework. India is also pitching a comprehensive convention on terrorism. How does China look at these proposals? Can we see some movement forward from China on the listing issue of 1267 Committee? A: I will answer your first question in the first place. On June 19, Foreign Minister Wang Yi met with Indian Minister of State for External Affairs Singh attending the Meeting of BRICS Ministers of Foreign Affairs. During the meeting, Foreign Minister Wang Yi pointed out that the current China-India relations are developing steadily on the whole. President Xi Jinping and President Modi held a successful meeting in Astana, which enhanced our mutual political trust and charted the course for the further development of China-India relationship. China wishes to join hands with India to follow through on the important consensus between the two state leaders and reinforce the mutually beneficial cooperation in politics, economy, trade, cultural and people-to-people exchanges and defense and properly manage and handle the sensitive issues and divergences in our bilateral relations. In particular, Foreign Minister Wang Yi welcomed the accession of India and Pakistan into the SCO. He pointed out that, both China and India are major countries with important influences, and China is willing to strengthen coordination and cooperation with India under multilateral framework including the BRICS and the SCO and jointly play a constructive role in upholding regional and world peace and stability. During the meeting, Minister of State for External Affairs Singh said that, India and China are both ancient civilizations and developing countries. India highly values developing relationship with China and wishes to work with China to take the consensus of the two state leaders as the guidance, keep high-level exchanges, strengthen practical cooperation across the board and properly handle differences. 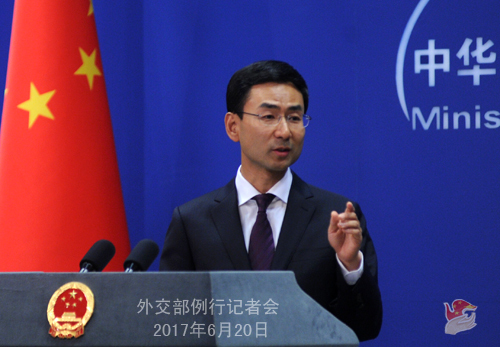 India wishes to reinforce coordination with China in multilateral fields, and make due contributions to upholding the common interests of developing countries. India also wishes to coordinate and cooperate with China to ensure a successful Meeting of BRICS Ministers of Foreign Affairs in Beijing and make preparation for the BRICS Summit in Xiamen in the second half of the year. On your second question, BRICS countries have the same or similar stances on terrorism. In fact, BRICS countries have conducted productive cooperation on terrorism for years. As I know, under the framework of BRICS cooperation, BRICS countries have set up a counter-terrorism working group. Under the framework of the working group, the competent authorities of the five countries have conducted sound exchanges and cooperation on counter-terrorism. On the comprehensive convention on terrorism you mentioned, China and other BRICS countries have an unanimous stance, that is, we all hope the UN General Assembly can adopt this convention as soon as possible so as to provide further guidance to global counter-terrorism cooperation. 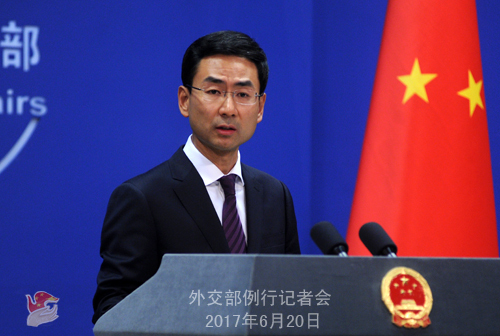 As to the proposal of global counter-terrorism efforts under the coordination of the UN, China agrees with it and adopts a positive atitude. As far as I know, the UN made some adjustments to its institutions on terrorism in its Secretariat in a view to further integrating the forces, increasing the UN inputs in counter-terrorism and better coordinating its members' cooperation on counter-terrorism. We support the UN in playing a pivotal and coordinating role in international counter-terrorism cooperation. As to the issue of the listing of the 1267 Committee, we have stated our position many times. We always stand for the proper handling of the listing matter in the principle of objectiveness, fairness and professionalism. As far as I know, members of the Security Council still have differences about certain listing applications, and China wishes to keep communication and coordination with relevant parties on this matter. Q: In his press conference, Foreign Minister Wang Yi also spoke about the concept of BRICS-Plus. Can you explain what this is about? Has it been discussed? Can we expect any action on this? A: Like what I said when I was answering the question about the BRICS just now, the BRICS countries are all representative developing countries and emerging markets with great influence. Since the inception of the BRICS cooperation, with a view to upholding the common interests and reflecting the collective voice of the developing countries, the BRICS countries have never ceased to communicate and coordinate with other developing countries and emerging markets. You may have noted that during the BRICS Summits in recent years, the BRICS countries held dialogues with other developing countries and emerging markets. These arrangements have further strengthened the interactions and cooperation between the BRICS countries and other developing countries and emerging markets. The concept of "BRICKS Plus" expounded by Foreign Minister Wang Yi means that the BRICS countries should further enhance the interactions, dialogue and cooperation with other developing countries and emerging markets and make the cooperation among the BRICS countries better reflect the common positions and collective will of the developing countries. Q: The American student Otto Warmbier who was held in the DPRK for 17 months died yesterday. He was in a coma in the DPRK for 16 months. It was only after pressure from the US diplomats that he was released. What does China have to say about the treatment of Mr. Warmbier and the final result? A: We have noted relevant reports. This is a tragedy. We hope that the United States and the DPRK can handle this issue properly. Q: Do you think that this death will have any effect on efforts to have dialogues which China is promoting adamantly? A:The Chinese side has always maintained that the Korean Peninsula nuclear issue should be resolved through dialogue and consultation. Our position on this is consistent and clear-cut. We are maintaining communication with relevant parties to promote the resumption of dialogue and consultations at an early date among relevant parties and strive for the settlement of the Korean Peninsula nuclear issue. Q: The Young Pioneer Tours company that helped Otto Warmbier go to the DPRK is based in China. It is one of several such companies that provide access to the DPRK. Has China considered increasing scrutiny on this company or taking any action in the wake of this incident? A: China has always implemented the DPRK-related resolutions of the UN Security Council in a comprehensive, earnest and strict manner. Meanwhile, we oppose one country imposing the so-called "long-arm jurisdiction" on another country in accordance with its own domestic laws. Q: It is reported that recently the assets of some Myanmar businessmen and inhabitants of the China-Myanmar border area in Ruili, Yunan province have been frozen because they are possibly related to such criminal cases as gambling. Some Myanmar people think that this will affect the normal border trade between China and Myanmar. What are the comments of the Chinese side? A: As far as we know, the Chinese police are investigating gambling-related criminal cases in the province of Yunan and have frozen a batch of relevant assets in accordance with law. This normal law enforcement action will not disrupt the legal border trade between China and Myanmar. The law enforcement departments of the two countries have close cooperation in combating cross-border crimes. The Chinese side is willing to continue to maintain close communication and coordination with Myanmar in investigating the cases, thus jointly upholding the good order along the China-Myanmar border area and the benefits of the inhabitants of the border area of the two countries. Q: Taiwan and Panama still have a free trade agreement. What does China think about this? A: Last week, China and Panama established diplomatic relations. The Panamanian side has stated explicitly in the communique that it recognizes the one China principle and promises that it will not have any form of official contacts or develop any form of official relations with Taiwan. The attitude of the Panamanian side on this is quite clear-cut. Q: Does a free trade agreement constitute diplomatic ties between Taiwan and Panama? A: What I want to tell you is that the Panamanian side has promised that it will not have any form of official contacts or develop any form of official relations with Taiwan. What are official contacts and what are official relations? This cannot be clearer.